Considering a classic wooden headboard for your bedroom? Here, we go over the ins-and-outs of wood headboards. Are you tired of blank walls? Give your bedroom some pizzazz with chic headboards. Traditional headboards have been used for centuries to create good feng shui in bedrooms. The idea is that with a strong, stable slab of wood behind your head, you’ll sleep better and feel grounded. Whether that’s the reason you want a headboard or not, a good wooden headboard looks great in any room and really does a lot to frame the space. If you’re looking for queen wood headboards or twin wood headboards, our selection of beautiful headboards is sure to have the right one for you. Beds are the focal point of any bedroom and are the first thing grabbing our attention when we walk into a bedroom. Beds also dictate which furniture can go where and how it is arranged. Give your bed the attention it deserves with a classic wooden headboard. Looking for something a bit special? Choose a unique headboard. Not only will your new headboard make your space look special, but it will also make sitting up in bed and reading or watching TV much more comfortable, too. Size - It’s really important that you measure your bed properly before you start to look at headboards. Get the wrong size and the overall look of your room will suffer. A headboard should line up exactly with the corners of your bed, or be over by a set amount that you’ve decided on. Style - Headboards aren’t stand-alone objects. Because of this, the style of headboard you choose will usually be dictated by the style of your bed. For example, if you have an ornate bed, a plain minimalistic headboard might not look that good with it. Color - There are so many colors to choose from when it comes to headboards. Perhaps you’re looking for a statement piece. If so, choose a bold, eye-catching color like turquoise or a rich jewel tone. Natural wood can also be stained in a lot of different shades. Whatever you go for, make sure it complements your bed and existing decor. Material - Boasting intricate craftsmanship, headboards made from upholstery, metals, and wood all introduce different design elements to your space. Base your choice of materials on your own personal taste. We spend a lot of time in bed so it’s important that we like our headboard! It's hard to beat this awesome chocolate and weathered oak wood headboard, made by South Shore, a must have bedroom accessory. Made of the highest quality of wood, dimensions: 78-Inch. Low price modern headboard, very affordable!. This is the best gray/charcoal wood headboard, a piece by Signature Design by Ashley, a beautiful bedroom design piece. Material: the highest quality of wood, size Queen/Full. Least expensive cost for retro headboard, amazing and affordable! Bold black wood headboard, brand: Zinus, model: OLB-IRPBH-14Q. Made with fine wood, best price for dreamlike headboard, a superb bedroom design piece, size queen. Now you can get the best contemporary headboard, a masterpiece! 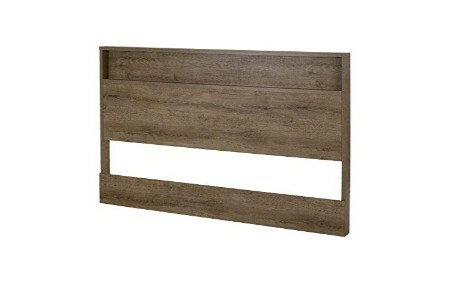 Prepare yourself for the best brown recycled wood headboard, by Sauder, astonishing bedroom classic accessory. Material: top-notch recycled wood, size full/queen. llw price shabby chic headboard, an ideal show-stopper! Incredibly cool, amazing weathered oak wood headboard, made by: South Shore, a delightful bedroom elegant piece. Made with classic wood, size: Full/Queen. The best deal for modern headboard, a very unique décor piece that's sure to turn heads. If you are like us you can't get enough of this rustic oak wood headboard, by: South Shore, refreshes your design, must have bedroom showpiece accessory. Material: classic wood, size: full. This is a top notch modern headboard, gorgeous! It's hard to beat this awesome rustic wood headboard, by: Ameriwood Home, amazing bedroom design piece. Made of supreme wood, size queen. Now on discount, retro headboard, it's also the perfect, affordable nostalgia decor idea! The ingenious top-selling wood headboard by Signature Design by Ashley, upgrades your style, amazing bedroom decor piece. Material: wood, size - queen. 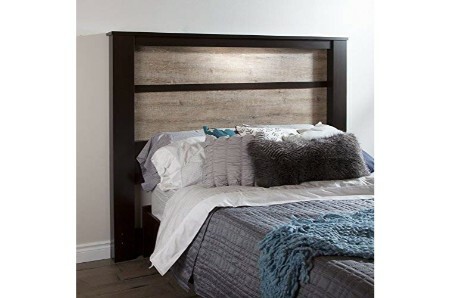 Save money with this wood headboard, special deal price, get it before it's gone! It's hard to beat this awesome cherry wood headboard, manufactured by: Dorel Living, a sublime bedroom stylish accessory. Material: the very best wood, size queen. Get a great deal for shabby chic headboard, tremendous! Classic natural wood headboard, made by Atlantic Furniture, model: AR281825. Material: prime wood, buy it now top rated wood headboard, a beautiful bedroom classic accessory, size - twin. A really unique modern headboard. Lookin for the perfect decor idea? You found it! Check this rustic mix wood headboard, by: Barn Walls, refreshes your design, must have bedroom accessory. Made with fine wood, size: queen. customized retro headboard, amazing! Discover the best antique walnut wood headboard, brand: Atlantic Furniture, amazing bedroom fine accessory. Made of high quality wood, size: queen. Least expensive cost for contemporary headboard, what's not to love? a really unique deocr item. Innovative antique walnut wood headboard, manufactured by Atlantic Furniture, model: R-186854. Made of the very best wood, exquisite headboard, a beautiful bedroom showpiece accessory, king size. It’s an amazing décor item! If you are like us you can't get enough of this sand oak wood headboard, brand: South Shore, a must have bedroom upgrade piece. Material: top-level wood, size full/queen. An affordable modern wood headboard, beautiful! Brown wood headboard, by: South Shore, model: 3659290. Made with prime wood, get a great deal for dramatic headboard, a heavenly bedroom design piece, size: 78-Inch. Ingenious invention, check out this retro headboard, a really unique deocr item. Get ready to have the best antique walnut wood headboard, manufactured by: Atlantic Furniture, astonishing bedroom design piece. Made with classic wood, size queen. Best price for wood headboard, a great masterpiece. Delicate crafsman oak recycled wood headboard, made by Sauder, model: 419881. Made of prime recycled wood, the best showpiece headboard, amazing bedroom artistic accessory, size: full/queen. This will put a smile on your face in the morning. Artistic whitewash wood headboard, made by: Barn Walls, model: Hanger. Made with top-level wood, this is a bargain price for a wood headboard, must have bedroom enhancement piece, size: Queen. It's incredible, magical and stylish! Make your friends' jaws drop with this gray oak wood headboard, a piece by Ameriwood Home, a beautiful bedroom upgrade piece. Made of top-level wood. Customized retro headboard, it's the real deal, blending design and style perfectly. 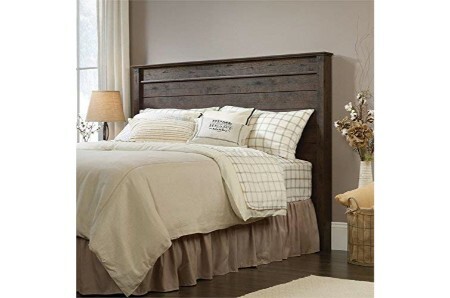 Experience an adventure with this weathered oak wood headboard, brand: South Shore, a delightful bedroom masterpiece. Made with classic wood, size: king. Low cost contemporary headboard, it's the real deal, blending design and style perfectly. Sublime cherry wood headboard, by Sauder, model: 411840. Made of high quality wood, low cost stylish headboard, a delightful bedroom layout accessory, size full/queen. Finally the best shabby chic headboard, a perfect work of art! Lookin for the perfect headboard? You found it! 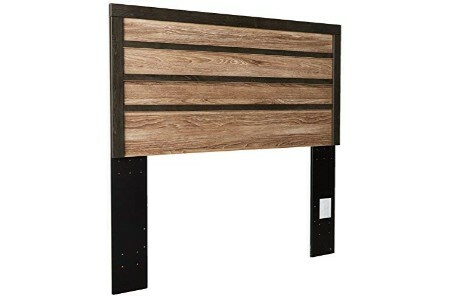 Check this recycled wood headboard, manufactured by: Sauder, refreshes your design, must have bedroom accessory. Material: recycled wood, size: Full/Queen. Buy it now, special sale price! Make your friends' jaws drop with this pure white wood headboard, produced by South Shore, refreshes your design, must have bedroom fine accessory. Made of supreme wood, size: twin. low price shabby chic headboard, adorable. Lavish walnut wood headboard, by Atlantic Furniture, model: R-187844. Made with first-class wood, low price refined headboard, a beautiful bedroom fashionable piece, queen size. The best-selling modern headboard, incredibly cool! A long time ago, when insulation wasn’t as advanced, wood bed backboards served an important function. They were there to stop chills reaching sleepers. As the way we built houses changed, so too did the way we viewed headboards. Although they are no longer a necessity, headboards are enduringly popular because of their aesthetic function. Some even provide additional storage spots. Be sure of your décor style: Headboards make bold changes to the appearance of your room, so before you choose the first one that catches your eye, make sure it’s in a style that you want. What can you afford? As with most things in life, your budget will dictate which headboard you’re able to buy. Before you go shopping, figure out the maximum amount of money you can spend. Because headboards are so popular, we’re sure that there will be one that’s right for you and right for your wallet. Consider your height and the height of the ceiling: Before you make a purchase, measure the height of the room and the height of the people using the headboard. Short headboards might be great for kids, but they can look awkward in high-ceilinged rooms. Measure yourself so that when you lean your back against your headboard, your head doesn't rest on the wall. Consider other purposes: You'd be surprised at the other functions a headboard can have beside aesthetics. If your room is low and compact, you can tuck a shelf behind the headboard. Short on space and looking for storage solutions? You can find headboards with storage space for books, lamps, bedding, and more. Glorious black steel bed frame, produced by Zinus, model: AZ-ASMP-10K. Made of top-level steel, top notch divine bed frame, a beautiful bedroom enhancement piece, size - king. The best bed frame, astounding and remarkable. Experience an adventure with this chocolate wood bed, produced by South Shore, upgrades your style, amazing bedroom classic accessory. Material: the highest quality of wood, size - queen. 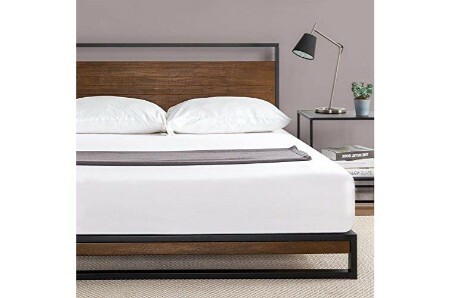 Discounted contemporary bed, don't linger around! Aesthetic chocolate wood bed, a piece by South Shore, model: 3159237. Material: top-notch wood, luxury ingenious bed, a must have bedroom elegant piece, size - king. The brilliant top-selling modern bed, an ideal show-stopper! The super best gray/charcoal wood MDF nightstand, a piece by Signature Design by Ashley, must have bedroom accessory. Made with wood MDF, size 24"Wx15"Dx24"H. this item received the best reviews for retro nightstand, amusing to utilize! Look no further and buy this warm gray/charcoal wood - MDF dresser, manufactured by Signature Design by Ashley, nostalgic furniture, classic accessory. Made with MDF. The best modern dresser, tremendous! The super best warm gray/charcoal wood - MDF dresser, produced by Signature Design by Ashley, surprising home décor accessory. Made of wood - MDF. Least expensive cost for modern dresser, incredibly fun!